When semi-automatic application is desired the L60 is a low-cost labeler designed to apply pressure sensitive labels. The L60 may also be adapted to automated production lines. The L60 is available in: Tamp, Tamp-Blow, and Blow-on. Universal labeling is North America’s largest manufacturer of made-to-order auto applicator labeling machinery. Their line of standard and custom labeling systems are designed and built in St. Petersburg, Florida, and sold and supported via a worldwide network of authorized distributors. From concept to completion…with over 30 years’ experience, the Universal line of labeling equipment is built from the ground up. 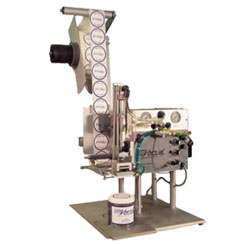 With their own in-house design, fabrication, assembly, testing and parts facilities, Universal is a complete manufacturer of pressure sensitive labeling machinery.